Scuba diving in Wakaya is a truly unique and euphoric experience. The reefs surrounding Wakaya are one of a select few protected Marine Reserves in Fiji. The team of Wakaya has been designated as wardens of this Reserve. This honor ensures we protect the reefs and marine life, in order to minimize traffic and maintain its unique natural beauty. How long have you been diving in Wakaya? A: I have been diving around Wakaya for over 10 years, however, I started diving 25 years ago. Diving is my life and my passion. How do the reefs in Wakaya compare to other diving locations in the South Pacific? A: Wakaya has eleven identified dive locations. The best way to describe the dives around Wakaya is the abundance of colors, the health of the corals and the diversity of the ocean life. What kind of ocean-life do typically sea around Wakaya? A: Wakaya is well known for the number of turtles, coral trout, sponges, lionfish, blue ribbon eels, hammerhead and gray reef sharks, barracuda, and anemones. We sometimes get lucky enough to swim with manta rays! How experienced a diver should you be to dive around Wakaya? A: Our guests come and dive with an array of experience, from avid divers to first-timers. Everyone will need to be PADI certified, which you can either do before arriving, or we will gladly arrange for you to get certified in Wakaya. What do you like to be sure guests experience while out on a dive? A: What is most important for me is to ensure our divers feel safe and enjoy each dive. There is nothing I love more than seeing their faces when they discover the beauty of all of the different colors of coral. What is the best time of year to scuba dive in Wakaya? A: I particularly recommend the winter months June, July, and August because the water is a bit colder (between 72-79 degrees) and clearer, and there is a higher likelihood of seeing manta rays. How deep are you able to dive off of the reef? Do you offer boat dives or shore dives? A: All of Wakaya’s dive sites are only a few minutes away by boat. What all is included in the Wakaya dive package? A: The package includes diving with dive instructors with a vast knowledge of the local reefs, up to date dive equipment, and of course the beautiful scenic boat ride. In addition, if you would like a customized package including visiting a private beach for a picnic lunch or anything you can imagine, please inquire! A: Yes, we offer night dive, which are a magical experience, however, you must be an advanced open water diver. Do you provide an underwater photography service? A: We encourage guests to bring their go-pro or any other equipment they might want and myself or fellow divers can take pictures, however, we can also bring a professional photographer upon request. 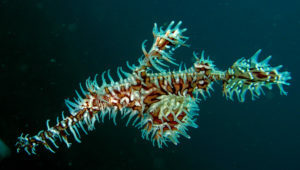 What’s the rarest fish that guests could possibly see during a dive? Photo by Steven Childs, via flickr, Creative Commons License.